#256. I Chopped Off All My Hair & Couldn't Be Happier. — Hey Eleanor! #256. I Chopped Off All My Hair & Couldn't Be Happier. My friend Dusti recently reminded me of the time I asked her, "Why do women cut off all their hair after they get married?" I think I implied it was kind of lame and sooo cliche. And yet, there I am, less than three months after tying the knot, with 10 inches of my wavy, strawberry blonde mop piled up on the floor. Now I understand that post-wedding cut. Like many brides, I grew my hair out for our wedding. Mostly, because I wanted a lot to work with on the big day. Once that had come and gone, I neglected my hair and it got too long and ratty and gross. I was so ready for a change. A fresh haircut for a new beginning! (I should write inspirational copy for, I don't know... CostCutters or something). The inspiration started where time goes to die: Pinterest. 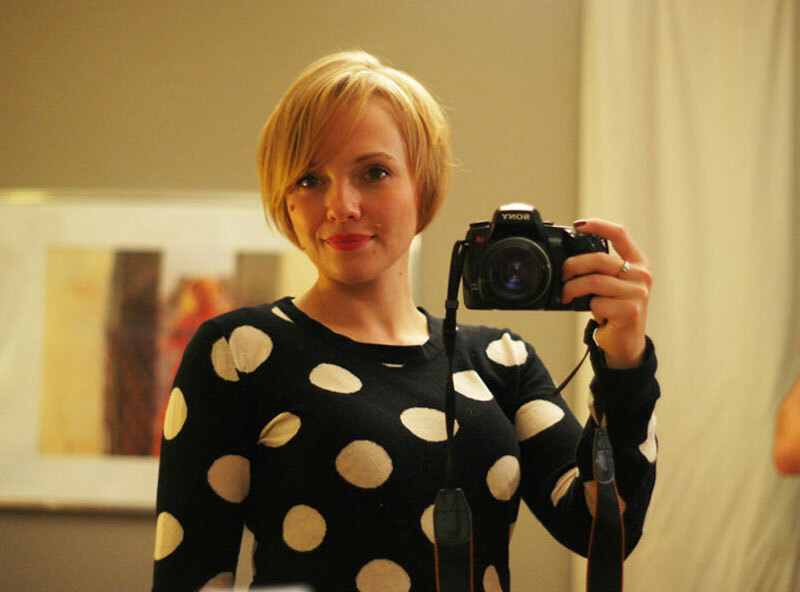 I was looking up pictures of Christina Ricci with short-ish hair, since we basically have the same face. Then, cause I'm just a basic broad, I started a Pinterest short hair board, adding a few 'dos from Katie Holmes, Kirsten Dunst and Julianne Hough. I shared the board with my hairstylist, Marissa. She got all excited and suggested we go for the shortest of the bunch (Julianne Hough/Michelle Williams). I was like YEAH! This is going to be great! I made an appointment. The next day, I was like, uh-oh. I started second guessing myself. Would I look like I was giving up? Too mom-ish (not that there is anything wrong with moms, but you know what I mean!)? Would my husband be attracted to me? Would I feel unpretty? Would my face look fat? I noticed every person who walked by with short hair, taking a mental inventory of what I liked or didn't like. Her hair is cute, but she's 72-ish. Oops, that's actually a man. The more I stressed about it, the more I knew this was a great Hey Eleanor challenge. So scary, and yet again proof that the things that can't kill you are often the scariest things. It's funny how attached we get to how we look. C'mon, Molly! It's only hair! It'll grow back (in a year or so). I arrived at the salon, sat down and said, "Let's do this." I could not wait for Marissa to make that first big cut. When she did, we couldn't turn back. This was happening. I could finally relax and I did. I even got a scalp massage. Twice. I love it! The cut, the color, the everything! Before, I felt so blah about the shape of my hair. Now, I feel like I actually have a hairstyle. It's so easy to deal with and looks fine blow dried, air dried, swept to the left OR right OR combed back (as long as I use an eyebrow pencil.... if I don't, I look like this). So psyched that I had the balls to do it. It's a silly thing, but I am really proud of myself. I never told Josh that I was getting my haircut because I didn't want him to dissuade me. When I got home, I hid behind out front door and yelled, "Don't be mad at me!" When I walked in, the first thing he said was, "You look beautiful." A huge shout out to Marissa Rasmusson at Julia Bretey Salon in Edina, Minnesota for the great cut, color & moral support; Jackie Dela Pole for taking the leap before me (she looks fab! ); and my friend Dusti who reminded me that it's just hair. What beauty trend/change in your appearance have you been thinking about... but are too chicken s#!t to follow through with?